Congrats to the Office team for releasing Office 2010 to manufacturing! I do expect some minor tweaks to the ClearContext 2010 ribbon to come in the v5.1 release. Watch the blog for future detail. 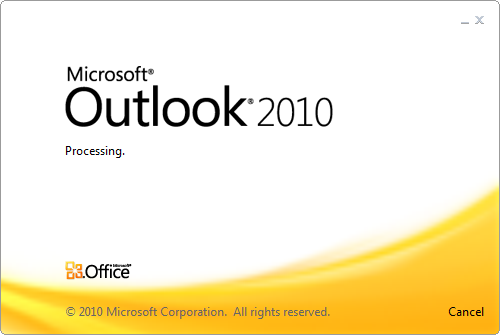 For those of your running Outlook 2010; the Outlook team has posted a patch to fix a message size bug in Outlook 2010. We haven’t noticed the issue here, but it must be a pretty nasty bug for MSFT to decide to release a patch to pre-release software. Details and a download here. If you are trying out the Outlook 2010 beta, please give the ClearContext v5.0 beta – with 2010 support – a spin as well. Details and download available here. We’re making ClearContext simpler, faster and smarter. Previously we discussed v5 single-click filing and message prioritization. Here are a few other near term changes coming in v5.0. A frequent feature request is to improve the accuracy of message conversation threading. In v4 and earlier, ClearContext uses subject name to link messages together. In v5 ClearContext will use Outlook’s conversation ID (when available) for threading. For those of you on mail servers that utilize this ID, the result will be smarter, more accurate conversation threading. Subject-based threading will be used in cases where the ID is not available, most notably when receiving mail from some webmail services outside of Exchange. In v5 we are removing the filing limitation of one primary and one secondary mail file. ClearContext will recognize all of your open mail files, allowing filing to all open PSTs. Office 2010 support will include full ribbon functionality in the explorer (Inbox) and adaptation of custom UI elements (Dashboard, Scorecard, etc.). A test version with Office 2010 32bit support will be available in Q4. We plan to implement 64bit support in a future release, timing TBD. FolderContext will no longer appear in each folder. This information will still be available via Project Dashboards. Conversation Priority will no longer be supported. Messages will still be automatically prioritized as they are received, but we will no longer support marking individual threads as important. Alerts will be removed in v5.0. Pending feedback, we may bring this feature back in another form for a future 5.x release. Many of the changes we have previously discussed result in improved performance. In particular, startup is faster, folders open more quickly, and message conflicts are minimized. With this improved infrastructure, the product will better support multiple machine use and mobile device access and we will be on track to expand beyond Exchange and POP support in future ClearContext releases. The changes we have discussed so far are all in our initial v5.0 release. Future v5.x releases will include an overhaul of the project management features in the Dashboard, improved statistics and measurement and much more. Keep an eye on the blog for future detail. All v4 purchases made after August 1, 2009 and all ClearContext Connect subscribers will receive a complimentary upgrade to v5. If you haven’t already signed up for the v5 beta, send an email to beta at clearcontext dot com. The beta schedule isn’t finalized yet, but we will let you know when a download is available. Categories: announcements, clearcontext, outlook, product. For those looking to squeeze more performance out of Outlook, the How-To Geek has published a comprehensive guide to making Outlook faster on Lifehacker. This is right in line with our own performance improvement recommendations. Posted by brad at 11:40 am on August 24th, 2009. Our next major release, ClearContext v5, will be about making the email management features our users have come to depend faster, more automated, and more intuitive. We've made many incremental improvements to ClearContext for Outlook over the past year, as well as some major additions like our statistics and effectiveness components. But we've also been working hard on the next major version of ClearContext for Outlook, and we're excited to share our plans with you. Please note that we are still early in the release cycle, so a number of these details are likely to change. We're very interested in hearing feedback about which features are most critical for you. Our initial release of statistics and effectiveness measurement focuses very heavily on email – volumes, response times, and performance. We’re continuing to gather feedback on the data you find most useful in understanding your email activity, as well as continuing to refine the ways we measure your email management effectiveness. If you haven’t already, please visit ClearContext Online and let us know what you would like to see there. In addition to email, ClearContext v5 will expand elements of the statistics and effectiveness modules into areas such as tasks, appointments, and project-focused measurement. In order to deploy these features and enhancements as quickly as possible, we are organizing the v5 release into several stages. The initial ClearContext 5.0 release will focus on the infrastructure and filing/organization features. Additional 5.x releases will focus on the project management and statistics areas. We haven’t finalized release dates and beta schedule yet. Stay tuned to the blog for more details. If you’re interested in being on the beta list, please send an email to beta at clearcontext dot com. Thanks for your interest! It's been a long wait, but the Office team is finally giving the public a preview of Outlook 2010, slated for release in the first half of next year. 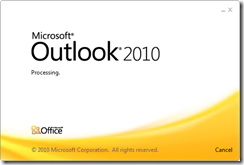 Check out the end of this post to read more about Outlook 2010. 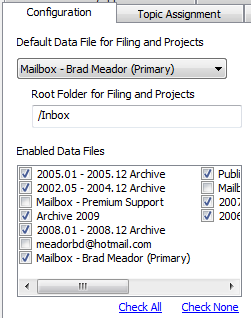 But why wait for 2010 when ClearContext Personal and Pro have Outlook 2003 and 2007 users covered already? Here’s a breakdown of some of the new Outlook 2010 features and their ClearContext counterparts. Outlook 2010’s new Ignore Thread feature moves all messages in the current conversation to the Deleted Items folder. Future messages are also automatically removed from the Inbox. ClearContext’s Unsubscribe performs the same function, plus lets you review the messages later or resubscribe to a conversation. The new default view for Outlook 2010 is a conversation view that groups all related messages together in the Inbox. ClearContext provides a similar threaded conversation view for the Inbox. More importantly, the MessageContext window displays the entire conversation for each open message. In Pro, it also shows any tasks or appointments generated during the course of the current conversation. 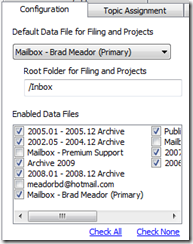 Quick Steps in Outlook 2010 are a way to set up macros for commonly used multi-step functions. ClearContext filing features provide many common functions without the need to create any macros — including single click filing (message or thread), automatic message filing when replying (or creating tasks and appointments), and automatic filing based on email history. It's nice to see productivity features like these making their way into Outlook – but at ClearContext we're already working on the next generation of more intuitive, powerful and automated productivity features for email. Tomorrow we’ll post our full product roadmap, highlighting our continued mission to help email overloaded individuals more effectively prioritize, organize and manage their email and projects within Outlook. Here’s Robert Scoble’s longer interview with Chris Bryant, Group Product Manager for the Office 2010 team. Posted by brad at 9:46 am on July 14th, 2009. Categories: clearcontext, outlook, product, productivity. The Office Team has released Office 2007 Service Pack 2 to the general public. Read about Outlook-specific changes here and download via Windows Update. We have been running beta versions of SP2 in house for several months now and have found that it greatly improves performance and reliability. I highly recommend that you upgrade at your earliest convenience. If you haven’t already installed the February Cumulative Update, SP2 will take several minutes to convert your Outlook mail file at startup. Trust me, it’s worth the wait. Posted by brad at 6:00 pm on April 28th, 2009.